The Manual – the book Bill Drummond and Jimmy Cauty wrote after this record went to #1 – is an essential read. It tells you a lot about the music business in the late 80s, a bit about the country in the late 80s, and it has many sharp things to say about Number Ones and their qualities. Plenty of glib things too, but entertainingly glib. You can get a PDF of it here and anyone with an interest in this site who hasn’t read it should prepare themselves for an enjoyable and sometimes infuriating hour or so. About the only thing it won’t tell you much about is this actual record. When introducing their “Golden Rules” the Timelords gleefully admit that “Doctorin’ The Tardis” is an exception to almost all of them. Use the latest house beat! They don’t, they go for an old Gary Glitter rhythm. Have a straightforward title! Theirs is a pun. Make the lyrics universal! Oh, come on. No, the hit may have given them the excuse to write a book but it barely even pretends to work as rationalisation: this is a banging novelty record and doubtless put together with no more or less cynicism and excitement than these things ever are. That’s not to say their instincts weren’t sound. 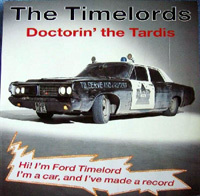 “Doctorin’ The Tardis” wasn’t the first recent attempt at doing a Doctor Who novelty record. Hi-NRG producer and big-time fan Ian Levine, a man not without hitmaking experience, had made an effort a couple of years before with “Doctor In Distress”, a song protesting the show’s then impending cancellation. This was a mortifying flop: Levine cared way too much and the public cared way too little. So even though Doctor Who was still limping on by the time Drummond and Cauty made “Doctorin'”, the record uses it without having anything to do with it*. Ahem. The Timelords mix this stuff in with the pop sounds of 1974, the year of glam rock and Davros, scarves on the Rollers and scarves on the new Doctor, glitterbeat and “Blockbuster” airhorns. It’s a companion piece to “Theme From S’Express” in that sense and just as good – part of the same rediscovery of the 70s, beckoning the boy gangs of yobs and nerds onto the dancefloor, the ones Mark Moore didn’t invite to his party. You could put it in a line of descent from “Hoots Mon” and “Mouldy Old Dough” too – novelty monsters which catch a time more truly than some of the serious songs do. Can I separate my love of this record from my Who fandom? Not really: at Poptimism in 2005, the night before the series came back, we played it – we had to – and Steve mixed it in with a 1998 number one by a future Doctor Who star. It was a great moment. But maybe I can separate it – the moment worked not just because we were excited about the show’s return, but because the novelty record and the teenpop track worked superbly together. I like to think I’d enjoy “Doctorin’ The Tardis” if I’d never watched a minute of Doctor Who. One would hope that at the funeral they ignore the 21 gun salute, and go for five rounds rapid. Romana aka Mary Tamm R.I.P. @92 Nah, she’s a Time Lord isn’t she. She’s just regenerating. I’m rather imagining her as one of the Swede’s favourites. I’m very concerned about all these people not much older than me (58 today week) who are popping off at the moment. Never mind The Swede, Romana was my 2nd favourite companion after Leela from 4 (Tom Baker, or BB if you’re familiar with P^nk S’ Who seies on FT) era Who. We also got more than we bargained for from Mary in The Odessa File as well. She had that aloofness as Romana, which I found intoxicating as a young ‘un. She will be sorely missed in Chateau Fatgit. RIP Mary. Would that make her Mucky Romanadvoratrelundar in his eyes? It certainly isn’t any of the three main 1980s versions; Peter Howell’s 1980 recording (the first complete reworking (*)) sounds quite different (especially the “guitar through a vocoder”(?!) used for the “response” half of the melody). The 1986 version has a rather thin, digital sound, and it’s definitely not the (then-current) 1987 version either. (*) Apparently they tried redoing it in the early 70s but abandoned it as unsatisfactory. It inadvertently leaked out on some Australian prints of the show. Not sure that counts, and it definitely wasn’t used for “Doctorin'” anyway! Indeed, ‘Doctorin The Tardis’ didn’t even make the Top 50 Best-sellng Singles of 1988. It certainly took me by surprise because I came back from holiday in Majorca to find this was at number one, and it felt like I’d been away for about ten years rather than ten days. You don’t get that anymore, do you, coming back off holiday and being surprised by what’s in the chart and in the news? Bit of a shame, that. #99 I actually had that experience only five years ago – even exclaiming “Wow T—- T—– is at #2!” having failed to realise they’d been at #1 for two weeks before that. In fairness I’d been ensconced in the Arctic Circle for much of that time. Nursin’ the Tardis? It’s PC gone mad! What next, a female Prime Minister, Queen, or a female mother for Jesus Christ?